Rise of the Nasty Nep-Enuts is the first level of World 3 found in Yoshi's New Island. 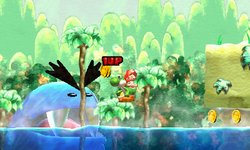 Yoshi starts the level in a jungle-like area with some Nep-Enuts and Ukikis, along with an arrow that points to the next area. Here, Yoshi needs to swallow some Metal Guys in order to clear a path to a Whirly Gate which transforms Yoshi into a submarine. After completing a brief obstacle course, Yoshi reaches an area with a Checkpoint Ring, some more Nep-Enuts, and the Goal Ring. ↑ しゅーや. (July 27, 2014). 【実況】コウノトリの尻拭い、ヨッシーNEWアイランドをツッコミ実況part3-1. YouTube. Retrieved July 30, 2015. This page was last edited on April 15, 2019, at 12:05.